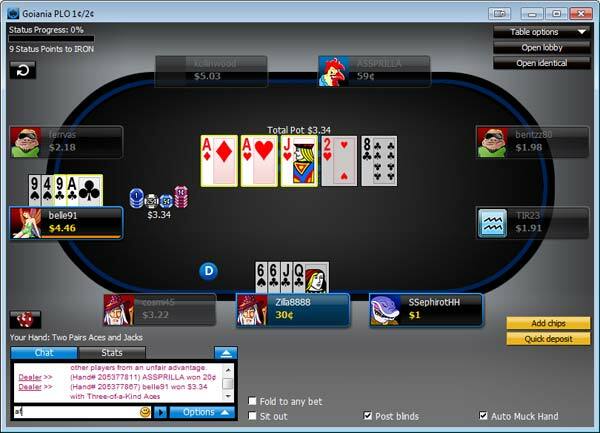 Omaha Hi Lo 8 or better is a popular poker game with many poker enthusiasts. It’s a variation from normal Omaha Poker with the difference being that two players can win on the same hand. This is because the total pot in an Omaha Hi Low high is divided into two. The first pot is awarded to the player with the highest ranking poker hand and the second pot is won by the player holding the lowest ranking poker hand. This added complexity means that there is a completely different level of strategy required to play Omaha Hi Lo well with constant consideration of not only what two hands (hi and lo) you are holding but also what two hands your opponents may be holding – suddenly you have doubled the amount of thinking power needed! 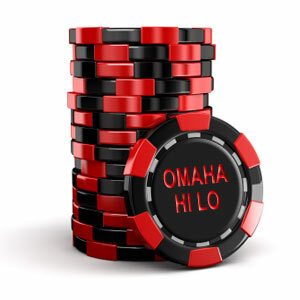 So… How do you play Omaha Hi Lo Poker? Omaha Hi Lo 8 or better is played in the same format and betting structure as Omaha. Each Player receives four hole cards face down. The dealer will then deal out a total of five community cards face up through out the hand onto the table. Each player must use 2 of their 4 hole cards and 3 of the 5 community cards to make both their high and low hand. They can use different cards for the high and low hands as long as it consists of 2 hole cards + 3 community cards. How is the Pot split in Omaha Hi Lo? To win a player must use two hole cards and three community cards to make their best possible high and low five card hands. As long as there is a qualifying low hand a player can win both the high pot and low pot. So this player will use any two hole cards and three community cards for his high hand and then also use the same or different two hole cards and three community cards for his low hand. This would be described as an 8-4 low. As always in poker a hand can also be won by a player making a bet that the other players do not match. This can happen at any time during any of the betting rounds. If this happens the player who has forced everyone to fold will win all chips in the pot at that time (including both the hi and lo pots). A Omaha Hi Lo poker hand is played in a identical way to a standard Omaha hand. For a more detailed explanation of the stages then read our How to Play Omaha Poker guide or see below for a summarised version. The dealer button is a marker that goes around the table in a clock wise rotation one position per hand. The dealer button marks out who will post the blinds and who will act first in each betting round through out the hand. The blinds are chips put into the pot before any cards are dealt so there are always chips to win with every hand. The player sat directly to the left of the dealer button will put in the small blind and the player to his left will put the big blind into the pot. The big blind is usually double the amount of the small blind. As the dealer button works its way around the table everyone takes a turn in posting the blinds. Once the blinds have been put into the pot each player will receive four hole cards face down. A round of betting then takes place with the player sat to the left of the big blind being the first to act. Fold – the player’s cards are thrown away and he will take no further part until the next hand. Call – the player puts in an equal amount of chips to the big blind amount or the a higher amount if anyone has raised acting before him. Raise – the player bets a higher amount than the current bet. All players who want to remain in the hand must now match this amount or raise it again themselves. The betting will continue around the table until everyone left in the hand has put the same amount of chips into the pot. After the first round of betting has finished the dealer will lay out three community cards face up onto the table, these three cards are called the Flop. The next round of betting starts after this and from this point onwards all rounds of betting will start with the player first to the left of the dealer button. This time the first player to act can either Check (make no bet), or Bet and everyone has those options unless some one bets. If anyone does bet then the options open to each remaining player changes to either Fold, Call, or Raise. The betting will continue around the table until all players have put in an equal amount of chips, if all players decide to check then nobody has to put chips into the pot to continue and the next stage of the hand comes about. The fourth community card is dealt face up onto the table, this card is called the Turn card. Another round of betting will start until all players have either checked or have put in equal amount of chips into the pot. The River card is the fifth and last community card to be dealt face up onto the table. At this point players will know what high hand they have and also if they have a qualifying low hand. Based on this information a last round of betting will start. If all players check or have put equal amount of chips into the pot we move onto the showdown. The showdown is where all remaining players left in the hand reveal all four hole cards to determine who the winner is. The pot is then split into two, one for the high hand pot and one for the low hand pot. If there is no qualifying low hand the player with the best high hand will win both pots. Omaha Hi Low can be a very complicated game to master for any novice as there are so many hand combinations. It is recommended that anyone who has not played this game before, practice on play money or low stakes tables for a few hands first as a simple mistake made can be very costly. The next stage for you is to head over to our Play Poker section where you can choose a trusted and recommended online poker site that offers Omaha Hi Lo games to get started playing. Practise is the best way to learn, so get yourself sat down at a low value stakes Omaha Hi Lo table and just follow the information outline above. Take it slow and don’t risk too much money until you are comfortable with the rules and structure of the game.